Edamame, or soybeans, are an ancient native crop from the Orient, and while it’s not a very popular garden crop, many people have started growing it for its health benefits. Edamame are quickly becoming a favorite on Asian menus and sushi restaurants, and so, if you’re a big fan of edamame, why not grow your own? Today we’ll show you how to grow edamame, or soybeans. Surprisingly enough though, they’re very easy to grow, much like regular bush beans. For edamame, or soybeans, to grow successfully, the soil temperature needs to be at least 50F, but ideally around 70F, otherwise seedlings just won’t grow. 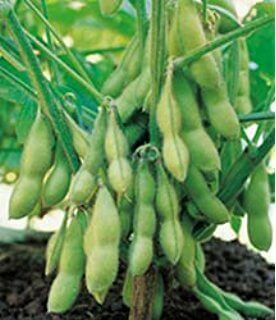 Also keep in mind that at their mature stage, soybean plants can grow up to 2 feet tall, so space is very important to them! Make rows 2 1/2 feet apart with 2-3 inches in between each plant. Sow each seed about an inch deep. Be patient when waiting for seedlings to appear: soybean plants mature a little slower than other garden vegetables. Choose good draining soil and be careful not to over-water. Too much water can cause big problems and may result in a crop that won’t grow at all. Soybeans like full to partial sun. Stay away from over-watering, and only water when soil is dry. Use a good quality soil with good drainage. 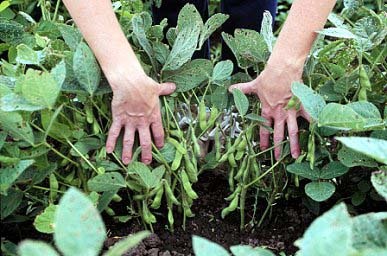 Harvest the edamame (the pods of the soybeans) when they are still immature and green. Make sure to harvest BEFORE the pods turn yellow. You can harvest simply by picking each pod off the plant or by removing the entire plant and picking off all pods. How to Grow Edamame was last modified: August 30th, 2017 by Aniela M.